Bike-sharing programs have increased in popularity across the United States in recent years. The initiative is especially robust here in New York City. In 2013, NYC launched Citi Bike, where locals and tourists can rent bikes at stations throughout the city, and return them to any other location for their convenience. The bikes can be used for any purpose – from commuting, to a fun adventure with friends, or simply to tour and take in the sights of the city. Citi Bike currently hosts 10,000 bikes across 600 stations, and is available in 55 NYC neighborhoods. Citi Bike provides a great outlet for exercise, getting outdoors, and engaging with one’s community and fellow residents. Although this may sound like a win-win for all, Citi Bike stations are unevenly distributed across NYC neighborhoods, as most of these stations are located in wealthier areas. Communities with low-income and minority residents are at a disadvantage by not having access to the potential health and social benefits Citi Bike offers. A recent study in Boston found that 43% of its’ White residents lived near a bike-sharing station, compared with only 7% of its’ Black residents. A few years ago, Citi Bike expanded to Bedford-Stuyvesant in Brooklyn. Bed-Stuy is largely composed of minority races, and has high rates of poverty and unemployment, as well as diseases such as obesity and diabetes. 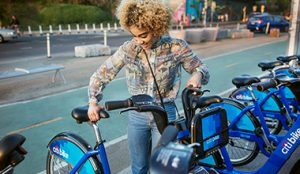 Although residents were initially opposed to the introduction of the program, results have showed that Citi Bike use more than doubled in Bed-Stuy, and has increased in surrounding lower-income neighborhoods as well. David Sandman, the President and CEO of the New York State Health Foundation, saw this as a great opportunity for lower-income NYC neighborhoods, and reached out to City Bike to discuss expanding their program into other similar areas. The two organizations have since worked together to assess the challenges and opportunities surrounding implementing bike-sharing in these neighborhoods. They found that although the New York City Housing Authority offers an almost 70% discount on bike memberships ($5 versus the standard $15), there were very low participation rates and low awareness, with 80% of residents in one neighborhood completely unaware of the opportunity. To increase use among residents, local organizations and community leaders are being encouraged to reach out to their neighbors and market the Citi Bike opportunity, both through face-to-face interactions, and banners and other marketing tools. Community engagement is a key tactic to ensure that the physical and mental health benefits Citi Bike provides is accessed by residents across New York City, especially in those often-disadvantaged communities who need it the most. At PARCS, we know many of our participants are leaders in their communities, who advocate for the well-being of their neighbors. To find out if there’s a station near you, check out the Citi Bike map here. Then get out there, and get bike-sharing! ← Celebrating the ‘Power of Play’ in July! What is The PARCS Study? When and Why Get Vaccinated? GetCoveredNYC–Apply by January 31th for Free or Low Cost Health Insurance! Celebrating the ‘Power of Play’ in July!